Herewith Merry Christmas is nearing!!!! It is story related cake. I have been This cake inspired me to bake as we had seen Malayalam Film as SALT N PEPPER wanting to do it and the wait is over. The same movie name has been remake in different languages..In that scene, A hero gives Juan's Rainbow cake recipe to the heroine and they tried the recipes together in different homes and been communicated over phone for recipe and experience and so on. This story behind the cake is so amazed to hear and It is all about Juan, A french lady who had waited for her hubby for his return from the 2nd world war far away from home. On her first day of wait, She baked a delicious Strawberry cake for him and in turn he didn't come. It is so disappointed. Second Day, She again baked a Pistachio cake for him and still didn't turn.It is disappointment again. She made 2 cakes joined and covered each layer with whipped cream. Third Day, She made orange cake and still her wait continued on and on...still he didn't come.She went to bed at the same day with disappointment. Next Morning, Her hubby had arrived at their home and saw his ladylove giving a box of gifted chocolates.They felt very happy meeting after long time. She had come back to the kitchen and stacked all the 3 cakes covered with whipped cream and each layer is covered with whipped cream. Finally she melted the chocolates and poured it over the top of the cake and topped with fruit and served a cake to her hubby. :) They ate it together of his return and their never end loving story... It is so beautiful story and I liked it .. Here are the ingredients for each 3 cakes!!! Ingredients: Egg, Butter must be at room temperature. Note: You can double the measurements if you are making 6 or 8 inch round pan. In a medium saucepan, add the chopped strawberries,2 Tbsp sugar and water together and stir well.Cook well until the strawberries are softened. Once it is cooled,Blend it into puree. Using a stand mixer with paddle attachment or hand mixer, Beat the butter and sugar until it is creamy. Add a egg and strawberry extract and mix well until it is well incorporated. Add the strawberry puree along with the dry mixture in 3 additions. Scrape out the sides and mix well. Add food color if you want. Bake it for about 30 to 35 minutes or until the tooth pick comes out clean once inserted. Allow it to cool on the cooling rack. Add the pistachios and milk in a bowl and let it soak for about 2 hours. Pureed it into a fine paste. Add a egg and pistachio extract and mix well until it is well incorporated. Add the pistachio puree along with the dry mixture in 3 additions. Scrape out the sides and mix well. Add food color if you want. Add a egg,orange rind,yogurt and orange extract and mix well until it is well incorporated. Add the orange juice along with the dry mixture in 3 additions. Scrape out the sides and mix well. Add food color if you want. Keep the bowl and whisker attachment in a freezer and set it for about 10 minutes. Pour the 250 ML heavy whipping cream along with confectioners sugar to it and whip it till it gets peak form stiff. Place the strawberry cake on the cake board base with little whipped cream. Put a dollop of whipped cream on the strawberry cake and spread it evenly and do the same for other 2 cakes. In a piping bag,place the chocolate whipped cream mixture to the one side and other side place the white whipped cream to it. with a tip 21. Do the borders on the cake as you like. I had poured the remaining melted chocolate over the center top of the cake and place the strawberries. Put edible pearls over the top as you like. Notes: IF you want the same deisgn as I have done for the cake .You can follow as mine followed the Cake boss's Checkered board cake inside. I had used Cookie circle cutter and cut into 2 one is medium and small....for each cake and place the corresponding cakes into a one. 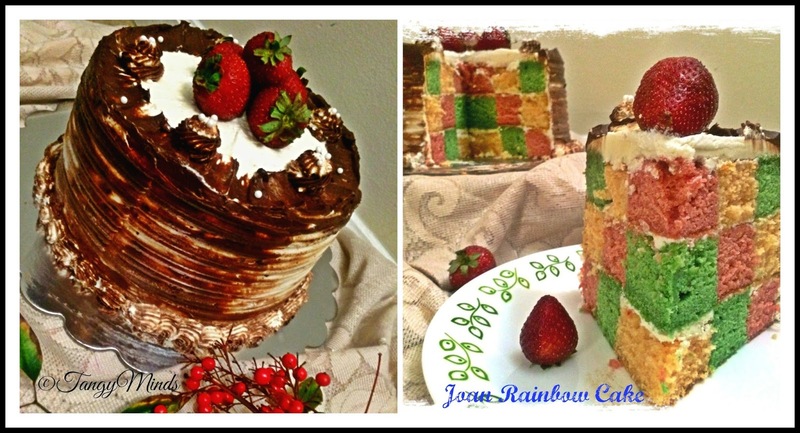 like pink,green and orange in a cake and do the corresponding.as shown in my picture. Linking this to Swathi of Baking partner's challenge!!! 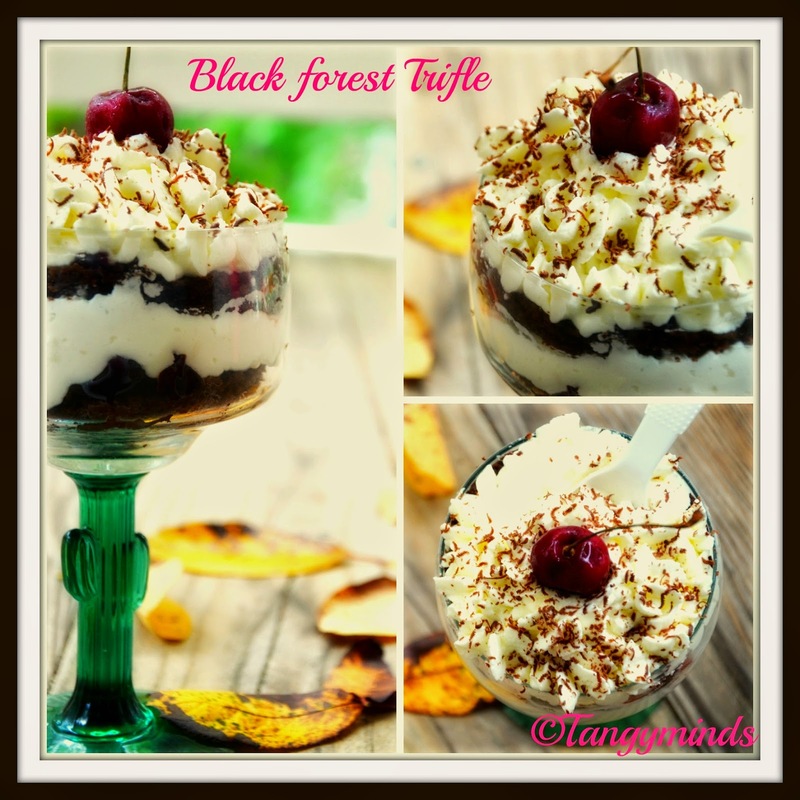 Here It is super weekend as I made very much light mini dessert called Black forest trifle!!! It is so easy and if you got homemade egg less/ egg based chocolate cake!!! I used to make black forest cupcakes, Blackforest cake and now black forest trifle in a serving glass!!!! It is so rich in texture and amazing..Go on try for it!!! Black forest cake is purely made from chocolate cake cut into each and every layer filled with whipped cream and chopped cherries and soaked in cherry or sugar syrup and filled with top and all sides of whipped cream and decorate it with chocolate shavings and cherries whole on the top!! It is so light and moist cake!!!! Fresh Cherries on the top for garnish. Place the bowl with whisk attachment into the freezer for about 1 to 2 hours before you make cake. I made chocolate coffee cake at the same day so you can use any chocolate cake or store bought chocolate cake or brownie.. I made 6 inch chocolate coffee cake and cut into the shape of the glass. Slice into 2 layers from the cake. Place the 1st cake slice on the bottom of the serving glass. Pour a tablespoon of cherry syrup and let it soak for about few minutes. Add sugar and vanilla extract to it and scrape out all the sides and whisk it well until it gets peak formed stiff.. If you have the remaining whipped cream,Transfer it into the piping bag with wilton 1 M or 21 tip then decorate it with stars or rosette. I have been waiting for the day to bake it after very long time.. I have been asked my hubby what cake you like the most. ? He said anything is fine but want very light sponge cake filled with lightest and melts in mouth..I thought that I would like to try pineapple gateau / Pineapple pastry cream cake... I have got everything so I am ready to wait for the day!! Finally it happened as I made him and my daughter very surprising cake with a praline on it and to the sides. It tasted amazing and totally loved it as it is very sponge and moist, filled with each layer cream and chopped pineapples cubes and topped with pineapple slices and praline to the sides.It tasted so heavenly and it got finished within 2 days !!! Am so happy seeing my family's faces and they are happy eating the slice of a cake with crunchy pralines. I am gonna bake it again for my friend's and family on any occasion. It is the best cake ever!!! Go on try for it. Preheat the oven to 350 F or 180 C.Line the baking pan 8 inch with parchment paper or grease it with butter and dust it with flour and keep aside. In a wide bowl, sift the flour,baking powder and sieve twice. In a big bowl, Add the eggs one by one , sugar,vanilla extract and pineapple extract and mix well until the eggs are well beaten. Do not over beat. Add the flour mixture in 3 additions into the egg mixture and fold gently by using spatula or wooden ladle..
Make sure it is well incorporated. Pour the batter into the greased cake pan and bake it for about 30 minutes. Slice it for 2 or 3 layers from the cake and place it on the plate. Mix all the ingredients given and whisk once. Keep aside. Freeze the bowl with whisk in the freezer for about 2 to 3 hours atleast. Refrigerate the cream for minimum 3 to 4 hours or its already refriegerated inside then it is fine.Once you start making take out the cream can from the fridge.It must be nice and cold. Whisk the cream for 2 minutes and then add the extract and sugar to it.Do not overbeat. Beat it until the peak forms stiff. 7 to 8 Whole almonds chopped finely. In a wide saucepan,add butter and sugar mix well...Let the butter melt and the sugar is getting dissolved and will let it to turn as caramelized. it will turn brown in color. It will take few mins to get the exact color,Add the nuts and mix well.Switch off the heat. Transfer it into the parchment paper on the baking sheet. Let it cool for about 10 minutes. Place the other parchment paper on the top and roll it by using rolling pin ,crushing it and getting crumbs..
Slice the cake in 2 or 3 layers. Take a pastry brush or spoon, pour the soaked pineapple syrup evenly...let it sit for about few minutes. Take out the whipped cream from the fridge,Take a dollop of whipped cream and spread evenly on each layer. Place the chopped pineapple chunks evenly on the whipped cream mixture cake. Repeat the same for the another 2 layers. Let it sit for few mins in the fridge. After few minutes place the praline on the sides of the cake with the help of your hands. Decorate it with whipped cream and pineapple slices or as you like to design on the cake!!!! Let it sit in the fridge for about 10 to 15 minutes or until the cake is set.Place the cake on the counter top at least 10 minutes before family or guest comes. I was looking for a snack at evening as I am thinking what to do for snack in the evening!!! 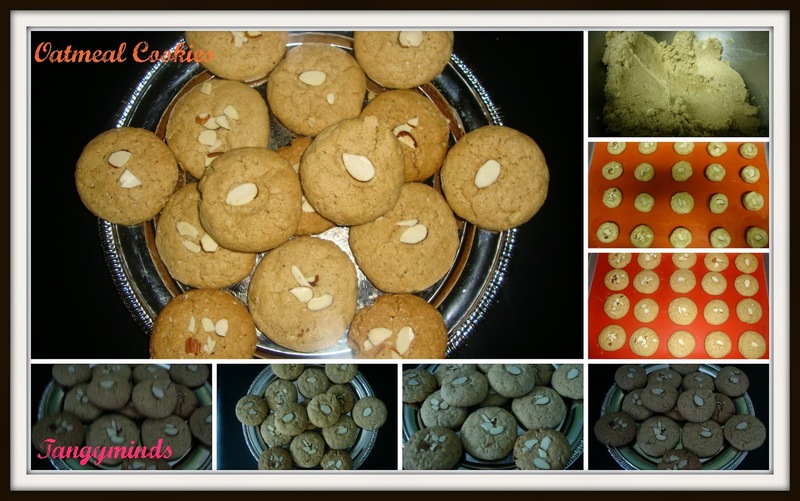 I saw big pack of oats and would like to try..Already tried American version of oatmeal raisin cookies and it was chewy inside..I would like to do differently and visited my friend's blog and found it so yum and it will b crunchy inside and outside too if you allow to bake little bit longer..It is very healthy one along with nut.It is great for kids for a snack box. 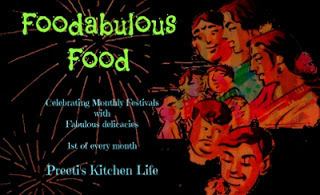 Here goes the recipe.Thanks a lots Priya!!! A handful of sliced almonds for decorating on the top of the unbaked cookie. Preheat the oven to 350 F or 180 C. Line the baking sheet with parchment paper or silicone mat.Keep aside. Sift the flour along with baking soda,ground cinnamon,salt in a bowl.Keep aside. Add the flour mixture to it in 3 additions.Mix well until it is well incorporated. Add the rolled oats to it and mix well. Make into balls from 1 Tblspoon of the dough for each and every cookie ball,flatten it and press gently and place 2-3 almond slices on the top of each and every cookie. so all will be having the same size of the cookie. Bake it for about 12 minutes or until the edges starts browning. Here We are so fan of hearty chocolates... I want to surprise my family as I made it at late afternoon...I served it after dinner.. IT was so good..Its the most gluten free recipe and it is very soft and lovely and can garnish it with whipped cream or chocolate sauce or fruits!!! 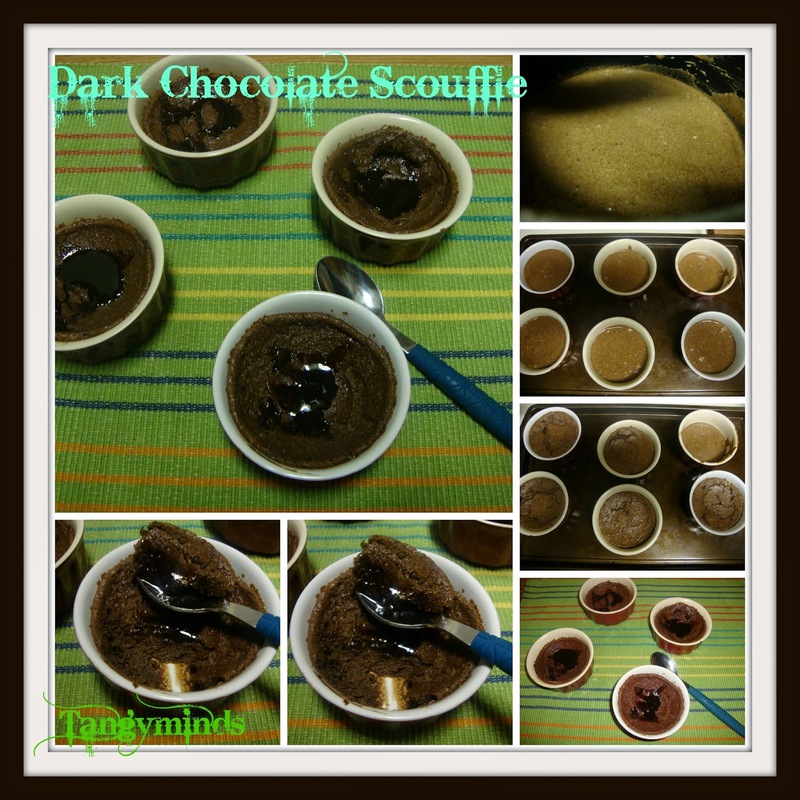 Recipe source : Dark Chocolate Scouffle!!! Preheat the oven to 350 F or 180 C....Place the ramekins on the baking sheet and keep aside. In a medium saucepan on medium heat,put the chopped chocolates with all powders and 2 Tsp of sugar and add milk...bring it to boil...Whisk gradually till it gets thickened. On low flame,whisk the egg yolks only and stir well until no lumps are found. In a separate bowl with whisk attachment of hand mixer ,beat the egg whites until it is frothy and add 2 Tsp of sugar to it and beat well until it is well foamy and stiff peak form. Fold the egg whites into the chocolate mixture by using spatula...one by one at a time. Mix well until it is well incorporated. Bake it for about 12 minutes. Readymade Puff pastry single sheet. Place the puff pastry on the countertop and let it remain at room temperature. In a medium pan on medium heat, add oil, onion and let it cook till it gets transparent and add tomato cook well till it gets cooked. Add all powders and cook well..
garnish it with coriander leaves if you want. Line the baking sheet with parchment paper.Preheat the oven to 250 F or 180 C.
Place the cut squares on the baking sheet. 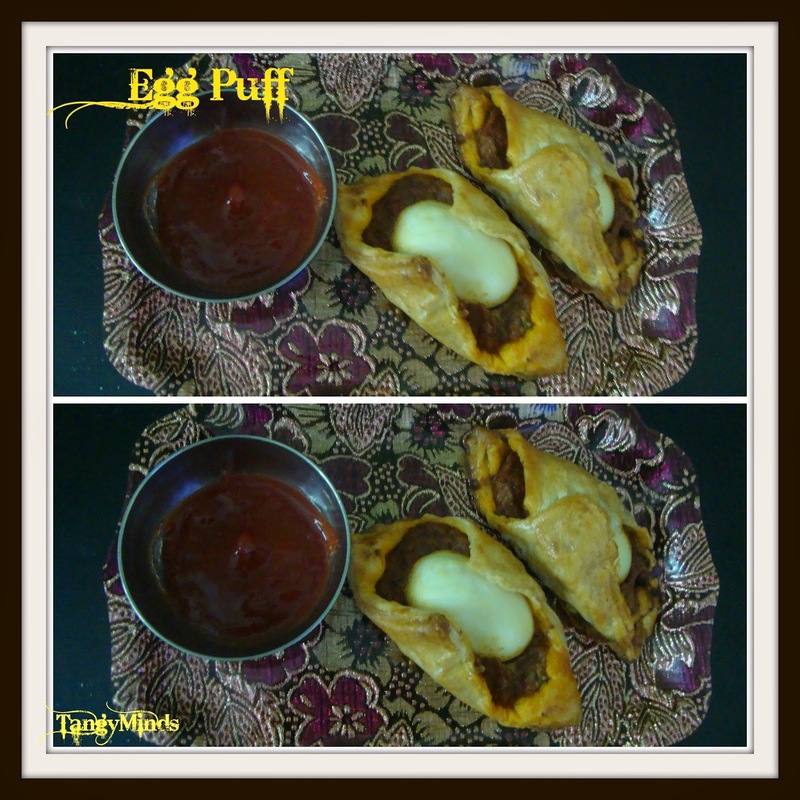 Take 1 Tbsp of the filling and place the whole egg or cut half of the egg and place towards the filling. Allow it to bake for about 10 to 15 mins or the top and edges are brown in color. 3 Medium potatoes Boiled,peeled off the skin and mashed. 5 to 6 green chillies finely chopped. 2 Tsp ginger garlic paste. In a wide pan,add the oil on medium flame, add the mustard seeds and let it splutter,add jeera,curry leaves and cook for few seconds and add ginger garlic paste. Add green chillies, chilli powder,garam masala and add mashed potatoes. mix well and cook it for about few minutes till the potato is well coated with spices. Place the semi circle on your fingers hand. place the water at the ends with the help of a finger. Make it into a cone (triangle shaped) and pinch towards the end of the top triangle. Place 1 Tbsp of the filling into it and press it gently. 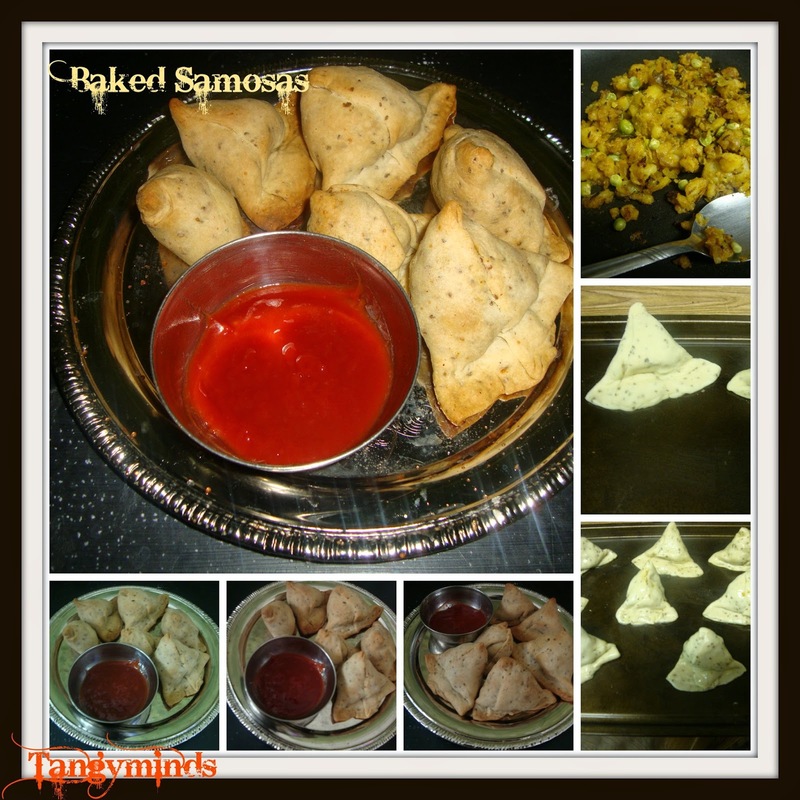 Place the samosa shaped sitting on the baking sheet. Preheat the oven to 350 F or 180 C..
Repeat the same till the dough gets over. Allow it to bake for about 12 to 15 mins or until the edges on the sides and top and bottom gets light brown in color. Allow to serve warm or hot and dip it with your favorite tomato ketchup or tamarind chutney.